WILMINGTON, Del., Feb. 01, 2019 (GLOBE NEWSWIRE) -- Today, WSFS Bank formally donated its former Wyoming banking office to the people and Town of Wyoming, in a key handing ceremony that was attended by Wyoming Mayor Frankie Dale Rife, members of the Town Council and the community, and WSFS’ local leadership team. This is WSFS’ second property donation in recent years to benefit the local community. In 2015, WSFS was proud to donate a property and house to the Central Delaware Habitat for Humanity that sits on an adjacent lot to the former branch building. The house was renovated in 2018 with the help of the local community and WSFS volunteers and an $8,000 donation from WSFS Bank. WSFS Bank donates building and property to the people and town of Wyoming, DE. 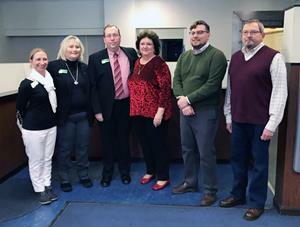 Pictured from Left to Right: Shelly Kavanagh, Vice President, Southern Regional Manager, WSFS Bank; Barbara Harris, Assistant Vice President, Retail Office Manager of Canterbury, WSFS Bank; John Steele, Vice President, Director of Retail Operations, WSFS Bank; Frankie Dale Rife, Mayor of Wyoming; Doug Denison, Vice Mayor of Wyoming; Carlen Kenley, Wyoming Councilman. WSFS Bank consolidated its former Wyoming banking office on December 28, 2018, into its Camden banking office less than two miles away. The agreement between the Town and WSFS includes the Bank retaining a full-service, stand-alone ATM on the property that will be easily accessible by Customers.